Whisk together flour, spices, salt and pepper. Stir in plant milk or water. Depending on the type of flour you use, you may need an extra tablespoon or so of water to reach the right consistency. Batter should be just slightly thinner than pancake batter. Toss cauliflower florets in batter. You don't need to cover every inch with batter; as long as they're mostly coated, you're good to go. Spread cauliflower on a lined baking tray. Optionally, spray lightly with oil to help it brown in the oven. Bake for 35-40 minutes, until slightly golden brown. Serve with your favorite sauce on the side, or toss in sauce and return to oven for another 3-5 minutes to bake the sauce into the cauliflower. *Brown rice flour or chickpea flour make great gluten-free substitutes, but you may need to adjust the amount of liquid in the recipe to achieve the proper batter consistency. 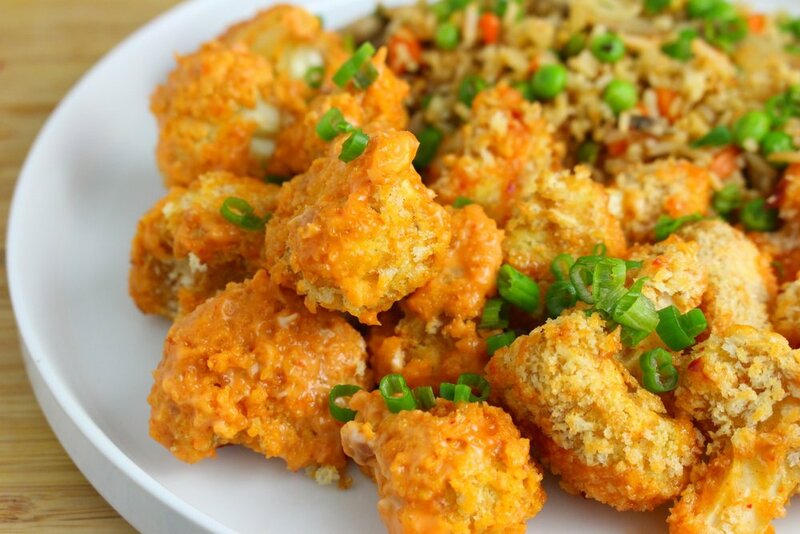 For buffalo cauliflower wings: Toss with buffalo sauce and bake for an additional 5 minutes. For bang bang cauliflower: Combine 1/4 cup mayo and 1/4 cup sriracha and toss cauliflower in sauce.